I use a Behavior Ladder (basically a clip chart) in my classroom to manage student behavior. Students earn dollars (Star Bucks) when they move up and lose dollars if they have to move down. They can use their dollars to buy items from the treasure box or pay to eat lunch in the classroom. This system has worked well for me. I’ve been slacking off on treasure box lately. I’m tired of having to buy things for it, and parents aren’t always consistent in sending things in. When I was off for four days a few weeks ago (I was so sick!) 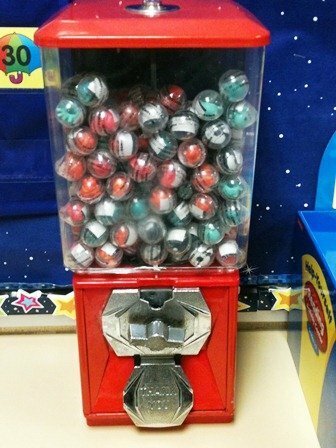 I was surfing around teacher websites and ran across one teacher who had gumball machines in her class as a reward. 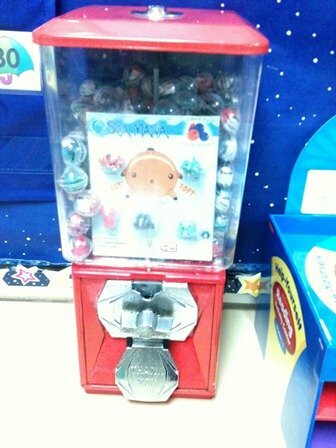 We aren’t allowed to have gum at my school, but I found myself thinking that gum isn’t the only thing that can go in a “gumball” machine. I started looking up machines you can put small toys in. I ran across one on ebay for a fairly cheap price. I decided to go for it and bought it! Since it’s used it has a few scratches here and there but it’s fully functional. I also bought some of those little squishy pencil topper guys to put inside. The machine takes quarters, and one night in bed I found myself re-thinking my Star Bucks. Money is such a hard concept for first graders to master. Why am I making them count fake money when they could be counting REAL money? I decided that after Spring Break I am getting ride of the Star Bucks. Star Bucks will be replaced with REAL pennies which they will trade in for REAL nickels, dimes, and quarters. I’m so excited about this! Since next year I will be using this system from the beginning of the year I think it will really improve their counting money skills! I plan on having students “recycle” their little plastic capsules their squishy friends come inside. That way I can refill them with erasers, more small toys, or even slips of paper with other rewards such as “lunch in the room” or “free computer time.” I’m so excited to get this going after spring break! Love it! I grabbed a gumball machine at a garage sale last fall but I still haven’t taken it to school yet b/c I haven’t filled it with anything. I’m thinking of ordering little bouncy balls for it. I love your plastic capsules, but my machine is for smaller things. Love you ideas though! I love it! Where did you get the plastic capsules from? I am going to start searching for one to put in my room! Hi, I will be teaching first grade this coming fall and I LOVE the idea of using real money instead of scholar dollars or whatever and my only question is, how do you keep your students from supplementing their income from change they find at home?